There's less than two weeks until Thanksgiving, and all our Cactus Flower Florists shops are in full swing for that holiday (and of course the one that comes a few weeks later). We have lush and gorgeous fall silk swags and wreaths available in beautiful rusts, oranges, golds. Drape a swag over the front door, or twine down a stairway railing. Hang a wreath on the front door to herald the season, or use as a unique centerpiece. Simply place the wreath in the middle of the table, centering a glass candle holder in the wreath. Our Scottsdale store is full of great decor ideas that you can use again and again. If you're the sort who feels no holiday table is complete without live, fresh flowers, check out our Thanksgiving arrangements at cactusflower.com. One of the most popular is 'Sunny Thanksgiving' which includes exotic tropical flowers mixed with warm autumn roses and trendy succulents for a spectacular feast for the eyes. Or, have one of our talented designers create a custom piece to match your linens and tableware, to make a seasonal table that will WOW your guests! Skip the napkin rings, and instead use a fall-themed bow tied around each napkin with a sprig of red hypericum berries tucked inside. Christmas may be all about the sparkle, but Thanksgiving is more about the homey glow. Save the silver and gold for next month. . . this month, use warmer metallics such as copper, pewter or brushed nickle. A cluster of copper teapots and molds with sprigs of autumn mums tucked in looks great! Down here in the desert, we really don't get the spectacular leaf color change that cooler climes experience. Make your own 'fall leaves' by taking a stem of salal (available at any one of our locations) and spray painting it with metallic copper or pewter paint. Allow to dry and sprinkle the individual leaves where a pop of color and shine is needed. If table space is limited, opt for a small cluster of bud vases or vintage bottles. Use stems of solidago, millet, fall daises or roses to bring color and interest. Don't forget the guest bathroom! 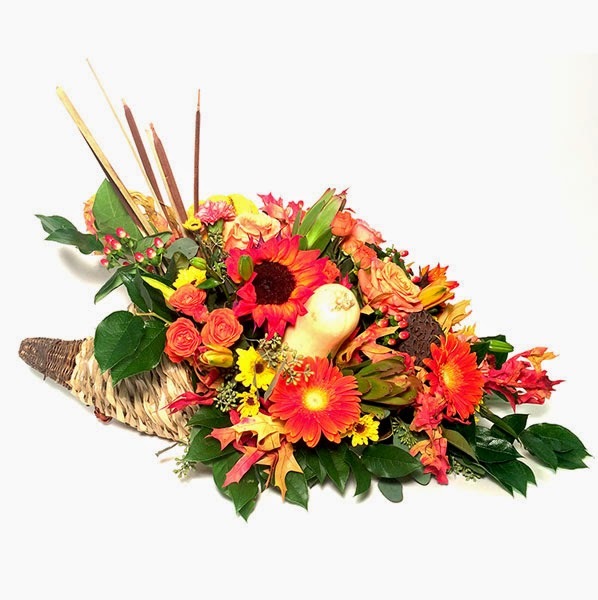 A small cornucopia or vase filled with fall flowers adds that extra touch guests will appreciate. Whether you're a traditionalist, opting for the rust-gold-red-brown palette, or prefer the bold and showy look with hot pinks, lime greens and purples -- or anything in between -- let Cactus Flowers help you set your table!